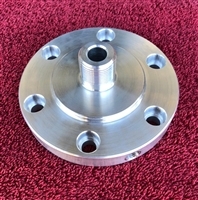 your cast top bearing cap with a tach drive. 6 hole bolt pattern. 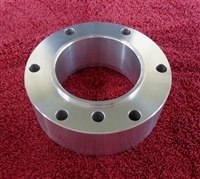 diameter driveshaft guards or can be turned down to fit your application. 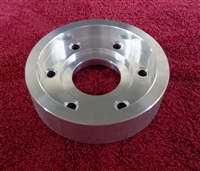 Made from beautifully machined 6061-T6 aluminum. 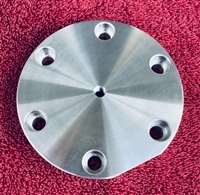 6 hole bolt pattern with small counter-bores on face to help conceal possible bolt galling. This bolts on the bottom rear of your v-drive, used in a direct drive application. 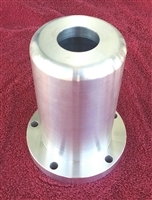 Made from beautifully machined 6061-T6 aluminum. 6 hole bolt pattern plus one hole for shift box. Used to adapt a Whirlaway to your v-drive. The Whirlaway Housing bolts in-between the v-drive case and shift box. 2x tapped 5/16"-18 holes to secure rear case during assembly.